09.30 v3.8.0 Supported MacOSX Mojave dark mode. 18.09.30 3.7.0 Supported MacOSX Mojave dark mode. 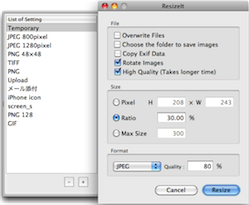 14.04.26 3.7.0 Supported file tag function of MacOSX10.9. Added Black & White conversion function. Fixed a bug which the covered image size can be wrong with high quality convert. 12.08.18 3.5.0 Added PDF conversion function. Fixed bug that converted image has some noises via JPEG-High Quality conversion. 12.04.14 3.4.0 Added "Lock setting" function. 11.11.26 3.3.0 Added image clipping function. 11.04.23 3.2.2 Improved memory management function. 10.12.18 3.2.1 Fixed bug that command line tool didn't work properly on MacOSX 10.5.x. 10.10.02 3.2.0 Added command line tool. Fixed bug that the app couldn't generate droplets on English environment. Fixed bug that the Automator action didn't work. 10.03.06 3.1.1 Resolved confliction of options. 10.01.10 3.1.0 Changed to convert images in folder recursively. Fixed bug that the converted image was smaller than setting with High Quality conversion. 09.10.12 3.0.1 Fixed bug that the app failed to convert with High quality option on MacOSX10.4. 09.10.10 3.0.0 Added High quality conversion feature. 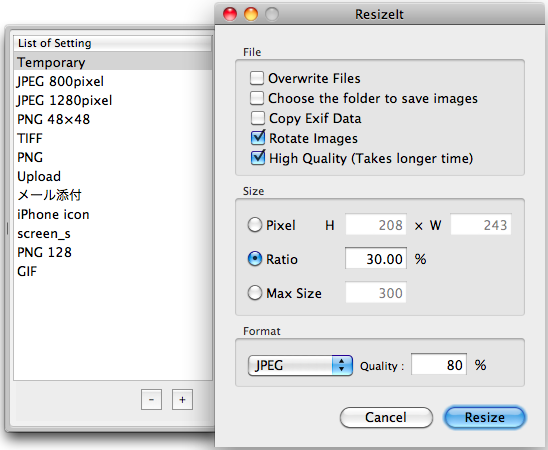 Fixed bug that ResizeIt can't export droplet on MacOSX10.6. 09.09.26 2.4.0 Added Action plugin for Autometer. 09.09.05 2.3.1 Added 64 bit version. 09.05.09 2.3.1 Fixed bug that the image extension is changed in capital letters after resizing. etc.